Each bride wants to look magical on her wedding day. They want to have a fantastic makeup, but in many cases they can’t afford visiting a beauty salon to have a professional makeup done. No need to worry. We are here to help you out with some easy bridal makeup tips that will help you look super-attractive and pretty on your big day! Take a closer look and master these techniques before the wedding! Preparing your skin for makeup is very essential. You should use an eye cream and primer to make your foundation stay long. It will also help you get rid of the skin pores, and your skin will have a healthy glitter. It’s very essential to choose the right foundation, taking into account your skin tone. You should apply foundation on your jaw and neck to create a perfect bridal makeup appearance. You are also advised to use a high quality brush to apply foundation onto your face. One of the essential bridal makeup tips is to apply concealer after the foundation. Spread little foundation on your face and do gentle touching actions. You will be able to cover the imperfections and your face will retain its glimmer. As for powders, it is best to look for natural or transparent ones. Again use a brush. Don’t apply powder everywhere, concentrate on your T-Zone. Your face should have a natural and fresh look. Consider that using a blush is one of the bridal makeup tips. Apply it onto your cheeks in the right way. Only in this case your face you will have a fantastic look on your wedding day. On this special day brides are advised to use eye shadows in darker tones. You should also line the internal part of your eye with eyeliner. Don’t forget to try it beforehand, as it will take you quite a long time. To have amazing and big eyes, you should apply two coats of mascaras. Waterproof mascara is just created for brides. Besides, you may also use a curling tool for your lashes. 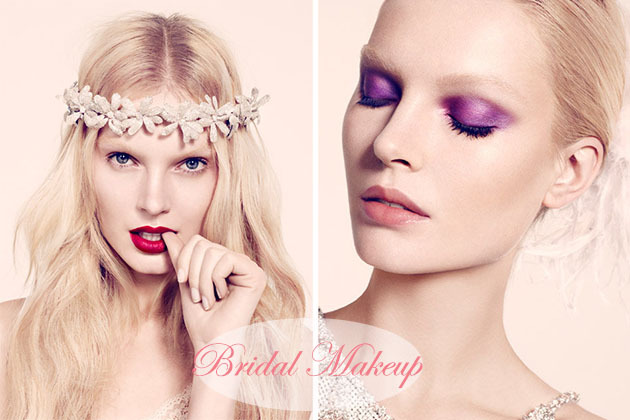 Follow these easy bridal makeup tips and have an alluring look, when saying “I do”. This entry was posted in Makeup and tagged beauty tips, bridal makeup, makeup tips.